The owners of Domaine Monpertuis, the Jeune family have been active as winemakers in Chateauneuf du Pape since 1775. The Jeune family created Domaine Monpertuis in 1971, taking the name of the estate from the small area where the vines are located, Mont Pertuis. However, Domaine Monpertuis is one of the oldest vineyards in the region as it dates back to the days of the ancient Romans. The Jeune family have been active in the Southern Rhone Valley since the late part of he 18th century. In 1970, Paul Jeune established Domaine Monpertuis. In 1999, Domaine Monpertuis brought in Philippe Cambie to assist in the growing and winemaking at the estate. Today, In 2013, Bernard Duseigneur bought 12 hectares of vines from Domaine Monpertuis and will produce his own wine at the property, Domaine Duseigneur starting in 2014. 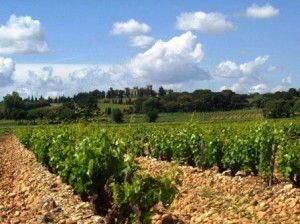 Domaine Monpertuis consists of 17 hectares of vines in Chateauneuf du Pape. 14 hectares are devoted to producing red Chateauneuf du Pape wine and 3 hectares are used to grow grapes for the production of white Chateauneuf du Pape wine. The Jeune family also own 31 hectares of vines in the Cotes du Rhone and Cotes Ventoux appellations. The 17 hectares of vines that are the source of their wine is spread over a wide area in Chateauneuf du Pape with an equally diverse array of terroirs that include clay, stone, sand, rocks, gravel and limestone. In total, the vines are planted in 48 different parcels. Domaine Monpertuis has old vines. In fact, Domaine Monpertuis owns some of the oldest vines in the region at close to 130 years of age! However, the majority of their vines range from 25 to 60 years of age. Domaine Monpertuis produces 2 red Chateauneuf du Pape wines and 1 Chateauneuf du Pape white wine. Domaine Monpertuis Chateauneuf du Pape Classique – From a blend of 70% Grenache, 20% Mourvedre and 10% Cinsault. From vines that average close to 60 years of age, the wine is aged in a combination of concrete vats and foudres for between 12 to 14 months. On average, about 2,000 cases are produced each year. Domaine Monpertuis Vieilles Vignes Secret de Gabriel – Made from 100% old vine Grenache with vines that date back to about 1880, the wine is aged in foudres and concrete vats for an average of 12 to 16 months. Close to 825 cases are produced each year. In 2007, the estate changed the name of the wine to Secret de Gabriel. Domaine Monpertuis Chateauneuf du Pape Blanc – 30% Clairette, 20% Clairette Rose, 20% Grenache Blanc, 20% Bourboulenc and 10% Roussanne. The production averages 1,200 cases of wine per vintage. Domaine Monpertuis can be enjoyed on the young side. Young vintages can be popped and poured, or decanted for about 1 hour, give or take. This allows the wine to soften and open its perfume. Older vintages might need very little decanting, just enough to remove the sediment. Domaine Monpertuis is usually better with 3-5 years of bottle age. Of course that can vary slightly, depending on the vintage. In the best vintages the wine should be consumed within 5-20 years after the vintage. Monpertuis is best served at 15.5 degrees Celsius, 60 degrees Fahrenheit. The cool, almost cellar temperature gives the wine more freshness and lift. Domaine Monpertuis is best served with all types of classic meat dishes, veal, pork, beef, lamb, duck, game, roast chicken, roasted, braised, stewed dishes, sausage and cassoulet. Domaine Monpertuis is also good with Asian dishes, hearty fish courses like tuna, mushrooms, cheese, pasta, eggplant and tomatoes. The white wine of Domaine Monpertuis is best served with a myriad of different seafood dishes, shellfish, crab, lobster, sushi, sashimi, chicken, pork and veal, as well as Asian cuisine. Vignobles Paul Jeune also makes wine from 31 hectares of vines they own in the Cotes du Rhone and Cotes Ventoux appellations. Ripe aromatics with spicy, jammy berries, black cherry, pepper and fresh herbs, the wine combines freshness and clean fruits. Farmed using only organic vineyard techniques, the winery is consulted by Philippe Cambie.